A pterygium is a wing-shaped growth that emanates from the tissue on the surface of the eye called the conjunctiva. The occurrence of pterygia are strongly related to sun exposure (i.e., UV radiation) and are associated with dryness, inflammation, and exposure to wind, dust, or other irritants. When small in size pterygia may be treated conservatively with moisturizing eye drops. However, when pterygia become large they may cause irritation not relieved with eye drops. A pterygium may also blur one’s vision by distorting the cornea which induces astigmatism and may even grow large enough to block light from entering the eye. In addition to medical treatment for pterygia we also offer advanced surgical options. Our goal in ptergyium surgery is to improve vision and decrease symptoms as well as to decrease the chance of recurrence. 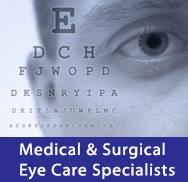 We accomplish these goals with same-day surgery utilizing a suture-less technique and conjunctival or amniotic membrane grafts.